A perfect transport should own such advantages as flexible riding, long range, high work efficiency and big consumer base. 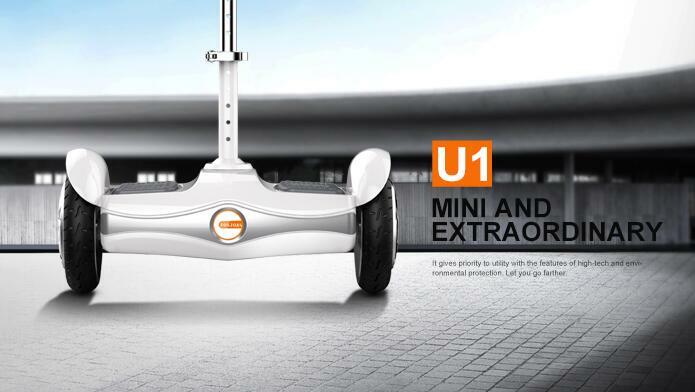 In recent, Fosjoas intelligent self-balancing electric scooters enjoy very good reputation and the new-published U1 mini electric unicycle is even highly praised as the multifunctional transport for people from all age stages. Although it is small in exterior, it is also powerful in interior. The following will explain why. In the very first sight of Fosjoas U1 mini electric scooter, you will fall in love with it immediately because of its cute and exquisite appearance. The two 10-inch Cheng Shin tyres are so small and the unique design of exposed tyres makes them enjoy much stronger adaptability in outdoor environment. In the middle of the board, there is a rise-and-fall saddle, which paves the way for double riding modes: sitting-posture riding mode and stand-posture riding mode. Consequently, rich riding modes attract more people to choose Fosjoas U1 mini electric scooter, including the elderly and the little kids. It is well-known that these two age groups are short of flexible limbs and good controllability, but they can ride Fosjoas U1 scooter at ease. Like others, Fosjoas U1 mini two wheel self balancing scooter is powered by electricity, which benefits from adopted advanced Japan-made SONY lithium-ion battery that has 130Wh and 260Wh capacities. Generally speaking, 260Wh capacity is able to sustain as long as 35km. What 35km can do? For retired people, they can ride it in park and enjoy fresh air in the morning. For little kids, they can ride it in the backyard happily. For young people, they can ride it to work every day. All in all, it can go anywhere. When people are fatigued by standing riding, they can pull out the saddle and continuously ride by sitting.